A bacterial species that depends on cooperation to survive is discriminating when it comes to the company it keeps. 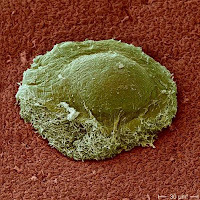 Scientists from Indiana University Bloomington and Netherlands' Centre for Terrestrial Ecology have learned Myxococcus xanthus cells are able to recognize genetic differences in one another that are so subtle, even the scientists studying them must go to great lengths to tell them apart. The scientists' report, which appears in a recent issue of Current Biology, also provides further evidence that cooperation in nature is not always a festival of peace and love. Rather, cooperation may be more of a grudging necessity, in which partners continually compete and undermine one another in a bid for evolutionary dominance. "In some social microbes, cooperation is something that happens primarily among identical or very similar cells, as a way of competing against relatively unrelated individuals in other cooperative units," said IU Bloomington biologist Gregory Velicer, who led the research. "This is unlike humans, who are more likely to cooperate with unrelated individuals as well as with close kin. In the bacteria we study, cooperation appears to be highly restricted." Myxococcus xanthus is a predatory bacterium that swarms through soil, killing and eating other microbes by secreting toxic and digestive compounds. When food runs out, cells aggregate and exchange chemical signals to form cooperative, multi-cellular "fruiting bodies." Some of the cells create the fruiting body's structure, while other cells are destined to become hardy spores for the purpose of surviving difficult conditions. Previously, experiments by Velicer and Ph.D. student Francesca Fiegna showed that when different Myxococcus strains isolated from around the globe were mixed together, the number of spores produced was much reduced. This indicated that this social bacterium had diverged into many socially conflicting types. Michiel Vos, then a Ph.D. student with Velicer at the Max Planck Institute for Developmental Biology in Tübingen, Germany, set out to find whether Myxococcus bacteria sharing the same centimeter-scale soil patch were still capable of efficiently forming fruiting bodies together, or whether these close neighbors would already engage in social conflict. As part of the experimental design for their Current Biology study, Velicer and Vos paired Myxococcus strains isolated from soil samples taken just centimeters apart to see whether they would behave cooperatively or competitively. The scientists found that some pairs of strains, inhabiting the same patch of soil and almost identical genetically, had nevertheless diverged enough to inhibit each other's ability to make spores. In general, however, the scientists found competition was less intense among centimeter-scale pairings than for pairings of more distantly related bacteria isolated from distant locations. These results indicate that social divergence can evolve rapidly within populations, but this divergence can be augmented by geographic isolation. Another set of experiments revealed that different strains actively avoid each other prior to starvation-induced fruiting body formation. Velicer and Vos argue that this type of exclusion within diverse populations -- in which the probability of social conflict among neighbors is high -- may serve to direct the benefits of cooperation to close kin only. Velicer says he plans to conduct an exhaustive search for specific genetic differences that lead to antagonism and social exclusion in pairing of closely related strains. "We've got lots of candidate genes," he said. A long-term goal, Velicer explains, is to understand how new species of social bacteria might evolve sympatrically, that is, in a geographical area shared with a parental species. "If strong social incompatibilities evolve rapidly, that has implications for understanding how interacting strains diverge over long periods of time," Velicer said.